As many of you know, this was my last week in the classroom. On Monday, I'm off to my new position as an instructional coach. I spent the last two weeks transitioning my class (since I was supposed to loop with them this year). The new teacher is all settled in and I miss the kids like crazy already. I'll still be posting on a regular basis, so I hope you'll follow along to see what my new adventure brings. I absolutely love reader's workshop and writer's workshop time! Over the years, I've searched and searched for a resource for reader's workshop. I've found lots, but last year I fell in love with this fabulous book. The best thing about it is that it includes a full year of reader's workshop and writer's workshop units. The reader's workshop and writer's workshop lessons are separate in the book (in case you have a required curriculum). 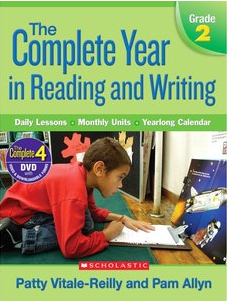 I used the 1st grade version last year and started using the 2nd grade version this year. The same authors wrote kindergarten through 5th grade editions as well. It is very user friendly and the mini lessons are clearly laid out. There are recommended mentor texts and anchor chart suggestions in each unit. We spent the week working on reading and writing stamina. 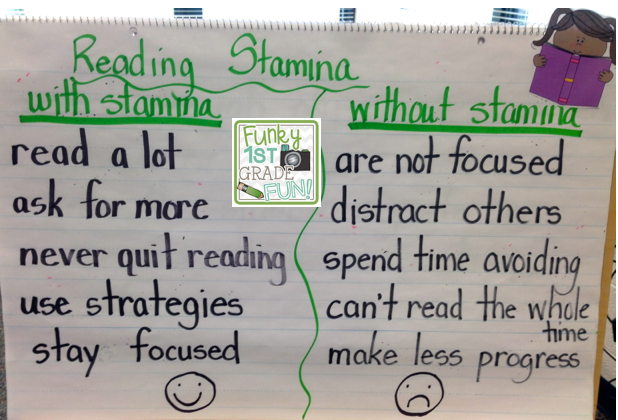 We talked about reading stamina first (only because reader's workshop comes first in my schedule). I made this anchor chart with my students. I added the smiley/sad faces when we created it together this year to help one of my special needs students. Each day I asked my students to choose something on either side of the chart as a goal to work on improving during our reader's workshop time. We did a "think/pair/share" at the end with partners to discuss whether or not they reached their goals for the day. We did the same during writer's workshop as we discussed building writing stamina. 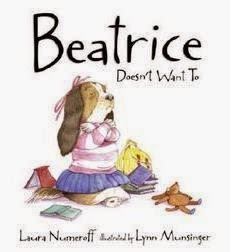 Beatrice Doesn't Want To by Laura Numeroff is my favorite mentor text to use for stamina building mini lessons. The story is an excellent way to kick off a discussion about both reading and writing stamina. 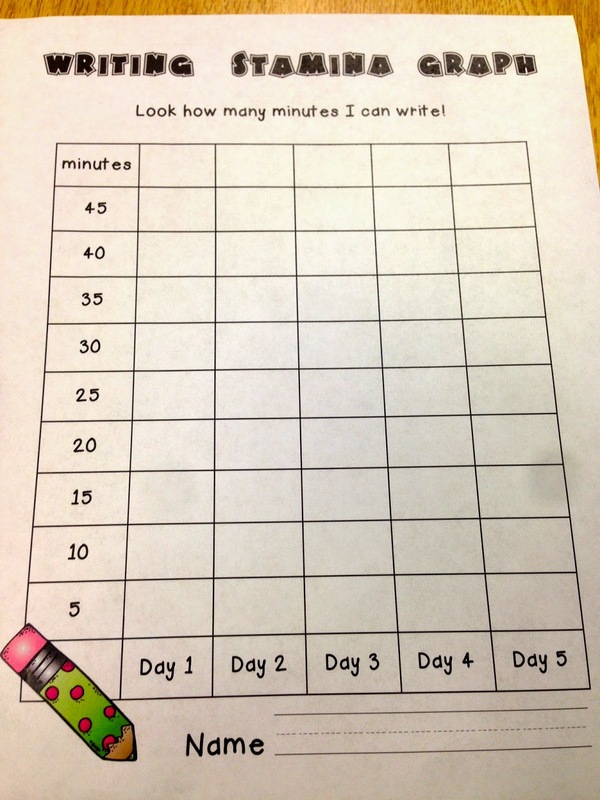 I read it toward the end of the week, because by then the students are able to identify the characteristics of reading and writing stamina (rather than having me point them out early in the week). Throughout the week, we also refered back to our "Things Writer's Write" chart to discuss how we could build writing stamina by working on different types of writing. We made a similar chart together at the beginning of 1st grade and they quickly ran out of ideas. This year, my students were so full of ideas that they begged me to make another list to add to this one. Unfortunately, I forgot to take a picture of the second one. I did not ask my students to fill out an individual stamina graph for reading this year. I wanted my students to be able to spend their reader's workshop time getting lost in their chosen texts, not watching the clock. I kept track of the time each day on an iPad timer and we celebrated our stamina building efforts at the end of reader's workshop time each day. 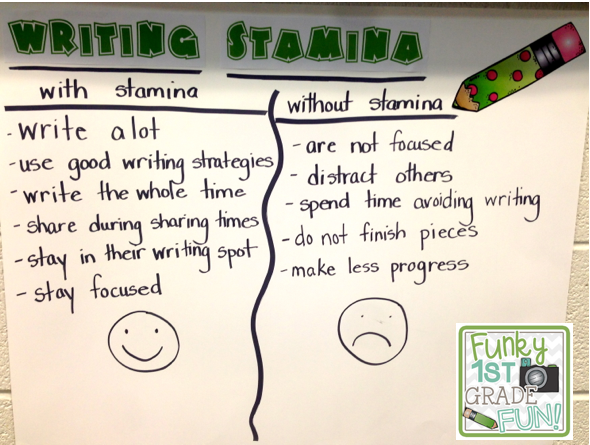 We did use individual stamina graphs for writer's workshop. I made the graph below. You can click on it to download a copy for yourself. I included 5 days on the graph, so you can use it for one week or make extra copies if you need to continue focusing on stamina for additional weeks. I'm off to enjoy this beautiful day! Thanks for sharing the charts! I'm working on building stamina with my group and I love the anchor charts!! Thank you! You're welcome, Michelle! Thanks for visiting. Best of luck with your stamina building!